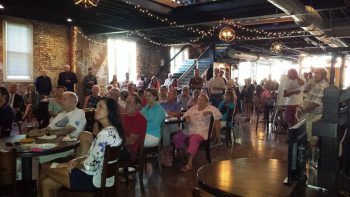 The My Community: My Voice campaign kicked off in Wilmington on Wednesday evening, Aug. 17, with a packed house at the local pub, Ironclad Brewery. The campaign, which is spearheaded by the North Carolina Coastal Federation, advocates for proposed improvements to New Hanover County’s Industrial Special Use Permit (SUP). The proposed improvements aim to promote clean economic development while preserving the environmental health of the community. About 100 people showed up to Wednesday evening’s event, and the crowd was energetic, ready to learn more and eager to ask questions. New Hanover County Commissioner Rob Zapple kicked off the event. He urged people to get involved in the process and spoke about why a Special Use Permit is so important to the county’s economic health. Kevin O’Grady, a Wilmington city council member, also talked at the event and spoke to the importance of zoning tools such as the Special Use Permit . Other spokespeople, including Cape Fear Riverkeeper Kemp Burdette and Wilmington resident Laura Kellogg, shared their personal stories with the crowd on why the SUP is important to them and the community. Kellogg is a registered nurse who moved her family to Wilmington because of her children’s asthma. In a blog post on the Model Industrial SUP website, she said adopting the Model Industrial SUP ensures New Hanover County residents have a voice in the county’s economic development. “Protecting a clean community is important for public health because I know firsthand what it’s like to live in a community with poor air quality,” she said in the post. Kellogg and Burdette are also featured in TV ads that are already running in New Hanover County. The event unveiled the rest of the campaign’s TV and radio spots, which are listed below. During the event, a rolling slide show introduced other spokespeople, who come from a variety of backgrounds, including restaurant owners, entrepreneurs and small business owners. The campaign for improving the SUP comes after a drawn-out and ultimately successful battle waged by many in the community to block Titan America from building a cement plant in New Castle Hayne. “In recent past proposed heavy industrial uses that came to our county that left the public out of the process. So we really need that local process that gives us the opportunity to get involved at the early stages before it’s too late and all of the state and federal permits are issued,” said Tracy Skrabal, coastal scientist and southeast regional manager for the federation. Now, the focus is on moving forward and ensuring that similar industries are not able to successfully threaten the community’s health — and Wednesday night, residents were enthusiastic about the cause. The next steps for interested New Hanover County residents are to attend the Aug. 30 planning board work session and the Sept. 8 planning board meeting and public hearing on any proposed changes to the SUP language. For more information, please visit nhcspecialusepermit.org. You can also contact Jennifer Salter at jennifers@nccoast.org or Mike Giles at mikeg@nccoast.org. Keep your eyes and ears out for TV and radio ads!